Bon Jovi's new album What About Now was released in Australia yesterday (March 8, 2013) and by lunchtime I'd started getting messages asking me if I liked it. Short answer? Yes, but I've honestly never disliked an album I paid money for on first listen, let alone a Bon Jovi one so the real test will come in a few months or even a year from now when you ask me if I'm still listening to it. I remember The Circle getting pretty good initial feedback before the hate started pouring in ;) but I for one still enjoy it. Several of the songs have already been played live so if you liked them live I don't think hearing the studio versions will change that, and if you hated them then I don't think the studio versions will change that either. What a lot of people have been wondering about is "production". And the people who pay attention to that sort of thing would also know that John Shanks produced the album, as he's been doing with Bon Jovi since Have a Nice Day. So for better or worse, there's your answer. If we'd gotten a solo Jon Bon Jovi album after The Circle, this might have been it or pretty close to it. It's sort of been a trend but the band didn't seem to have a whole lot to do with this album. FYI Richie Sambora is credited on five tracks on What About Now along with a third collaborator (either Billy Falcon, John Shanks or Desmond Child). Apart from that Jon wrote with Falcon or Shanks. "That's What the Water Made Me" is still my favourite song from the album. And currently right up there with my favourite Bon Jovi songs of the last 13 years. "I'm With You" reminds me a little bit of "Nothing", which was originally written for Have a Nice Day but ended up being recorded by Bo Bice as "Nothing Without You" on his debut album instead. I always liked the Bon Jovi version of the song though. Shanks has co-writing credits on both songs. "Thick As Thieves" is dire. It reminds me of "Save the World" from Crush, which is one of my least favourite Bon Jovi songs (Sorry to anyone who loves it). Bonus tracks "With These Two Hands" and "Into the Echo" aren't perfect but at least they don't make me cringe like "Thick as Thieves". Have you listened to the album? What do you think? Good review. I will get my copy in a week or so. I anticipate having 3-4 favorites, 3 "meh," and 3+ that I cannot stand. Fairly typical for many album releases not just Bon Jovi. I seldom listen to the Circle anymore but did like 4 songs on it very much. I do wish Jon would change producers just to change things up but he seems to stick with the same writers, etc. Unless it totally bombs, he will stick with Shanks. Well... I see there is a lack of guitars in this album. I was expecting something more hard rock. I think Bon Jovi has set as target the american audience. Here in Europe we like a bit heavier sound. I don't want to listen from people saying the band did the best it could 'cause of their age. AC/DC and Rolling Stones are on their '70s and they 're still rocking as hell... This album is not the best for me. I liked 4-5 songs but they don't drive me crazy. This is just my personal opinion and I respect others' opinions. I'd prefer to release the new album later. By that way maybe it would be better (always in my opinion) with more rock elements into the album. Let 's not forget Bon Jovi are a rock band. I have some more objections about the band... I don't know why and I hope to be wrong but something is not going ok. They started the tour before their new album is out in the stores, the official fan club is totally messed up, the dates of this tour come out very slow (Latin America and Japan still with no dates except Rock in Rion in Brasil and Australia we 've learnt some days ago), all this cell phone app thing is not ok 'cause many people have not smart phones. 1) Did I like the new album? -No! 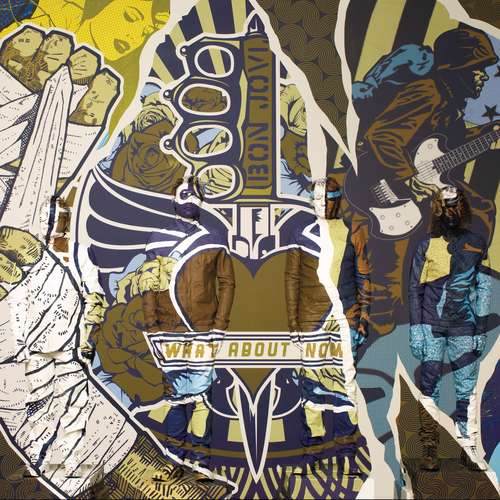 2) Could Bon Jovi have better tracks in this album? -Yes, 'cause they are extremely talented and they have proved that to us. 3) Will I buy it? -Yes, 'cause I want to have a complete collection of their discography and not only. 4) Should Richie has been more involved in the album? -Yes, 'cause he showed us with his latest album "Aftermath of the lowdown" how fresh his influence could be. I agree with a lot that you say. They have for years said with each new album (except Lost Highway) that they are releasing a real rock album and then the fans are always left disappointed. If the songs are great, I don't care but obviously fans have said over and over that they want more rock and more guitar solos. And I do wish the tour will announce more dates. I am really hoping for a Vancouver or Seattle show but they have yet to show up anywhere even though the original list of shows had them as April dates I assume it must mean that no promoter has stepped up to pay for the shows? I, too, think all is not well in the Jovi world although obviously they have a great fan base and still play to packed arenas. Overall the album is good (and yes, TWTWMM is one of their best ever). Better than the Circle? Definitely. Better than Lost Highway? Probably. Better than HAND? We'll see in a year. Why so critical? I understand that we all have different tastes, but the band is developing, they are trying different styles and genres. Times are changing, so is their undestanding for music. I don't get this - people want bands to play the same stuff over and over again. We, as fans, should like the fact that Bon Jovi always push forward, not look back. The new album is great music, imho. Yes, it doesn't have songs like Dry County, Always and These Days in it, but one can write songs like this once, right? Personally, I would put Amen and Thick as thieves among their top 10 ballads. I agree with a lot of what you said. I see the musical changes in the band as just that - changes to the music they are making and I don't expect another "Slippery When Wet" which I don't think is such a phenomenal record anyway. I seldom listen to a lot of it anymore because I'm really tired of Wanted, Prayer and Bad Name. SWW just seems to be the be-all and end-all for SOME fans (obviously not all), so I find it surprising that people 20+ years later are still wanting another version of it to come out. I do get the rocking harder desire though - I was listening to "Hook Me Up" last night for the first time in ages and it has such great guitar on it. I had forgotten that. I guess I am just glad that they are still making music period. I've been a fan for 29 years, so to keep getting new tunes from my favorite band is great to me. *shrugs* But I'll accept that not everyone sees it that way! I'm finally listening to the record now after grabbing at lunch time and am surprised you didn't mention "The Fighter" here. On first listen, I like it, but it SCREAMS of a JBJ solo song. I couldn't find the deluxe edition so I'm having to order that one - see what you get for trying to shop local and then can't find anything - but I'm liking most of what I'm hearing. I need repetition before I can make a firm decision. Jon played The Fighter with Bobby and Lorenza at a fan club show last year, along with Not Running Anymore and Old Habits Die Hard for the first time -- It does have a very "solo JBJ" feel, and he is the only credited writer on that song. Ahhhh...now that makes perfect sense. I knew it sounded like a solo song more than anything and he commented in USA Today last month that the record was as much a solo record as a band record and then he backpedaled on that a little, like he didn't want to offend anyone, but again, from the songwriting credits it all makes sense. Thanks! I have to say that this is the first time I have ever been left deflated in hearing a new Bon Jovi album. I feel that this album has no identity at all and as a whole the guitars are so wishy washy it is untrue. I personally do expect them to write great songs which can rival the 80's/90's periods because in my opinion they have plenty of times proven that they can in the 00's material. I must say the 1st solo from Sambora on Army of One is actually pretty cool and better in the studio then live because he does some very cool whammy bar licks similar in vein to Blaze of Glory. Though, why he comes in halfway through on the outro solo is bemusing to me. The 'Water' track is great as is the 'Fighter' in its personal reflection, and Room at the end of the World has depth but there is no unity in this record. For me, this is the weakest album they have ever done. I like it very much. I stopped worrying so much about the band repeating These Days (my favorite record ever) and have accepted that they've changed as a band and that, vocally, Jon isn't in 1995 anymore (as a singer - of sorts - I know first-hand how demanding his job is as a vocalist and that your voice can't always reproduce your younger voice).